We have already heard Google is likely to officially lift the cover off the Android 4.4 KitKat, and likely a Nexus 5 smartphone and Nexus 10 tablet, but it might have one more surprise - a smartwatch. A device branded Gem may launch alongside the Android 4.4 KitKat on a massive event that is scheduled for October 31st, according to Android Police. The supposed Google Gem, if it indeed gets unveiled at the end of the month, might turn out to be a big launch. After all, everybody is expecting a huge new niche to open with wearables in the coming years, and all the big companies including Apple are by all visible clues exploring this niche. The Google Gem rumor is an interesting one since it aligns well with one device we’ve heard about earlier - the Moto xWatch. 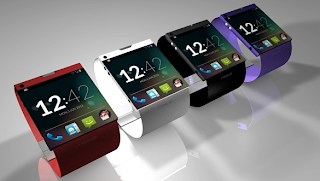 The xWatch was rumored to launch alongside the Motorola Moto X, but with Google owning Motorola, the main company might well have decided the watch is worthy of a Google-wide release. This last summer we heard about that xWatch integrating well with the Moto X, and if it gets a Google-wide release, a probability is that compatibility will be with a much wider set of Android devices. Now, we’ve already seen the Samsung Galaxy Gear watch, and with many compromises everyone seems to agree this is not what the smartwatch of the future looks like. Let us hope that Google manages to surprise us with this one - it would be a well-kept secret as we’ve seen no huge leaks of it. In either case, keep in mind that this is just a rumor and the October 31st release date is a month old rumor.